When braking an automobile equipped with disk brakes, especially at low speeds, an annoying squeaking sound would occur. The cause for the squeaking can be determined by nonlinear vibration analyses. Also the influence of different parameters can be investigated. First, the disk brake of an automobile was modeled in MATHEMATICA with 30 degrees of freedom. For this model, the nonlinear friction vibration effects between both brake blocks and the disk were quantified and detailed parameter studies were carried out. 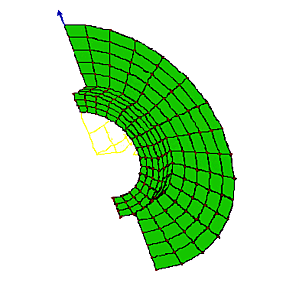 The results of these simulations were then used as input data for an FEA model (top figure), which then provided the modal data (center figure) of the built-in brake disk as an input for a coupled acoustic simulation (BEM). 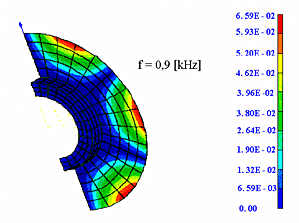 The acoustic simulation shows the acoustical radiation behavior of the brake disk (bottom figure). 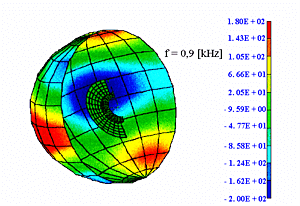 The calculated radiation characteristics can be used for example to determine the ideal position of the microphone on a test stand to detect squeaking noises. The parametric investigation of the brake squeaking phenomena shows that besides the friction and braking force processes, the geometry and coupling of the brake blocks on the saddle determine if a disk brake tends to squeak. In the described case, it could be proven analytically that the disk’s natural frequencies at 0.9 [kHz] (center figure) and 2.9 [kHz] cause squeaking. This was confirmed by sound pressure measurements.